Festival honouring Bel as god of fire and sun and Belisama as goddess of shining waters and high summer. Festival celebrating the longest day and shortest night and the bounty of summer. The name ‘Bel’ means ‘Bright’, ‘Shining’ or ‘Mighty’ and is attested across Celtic speaking countries from northern Italy and Austria to Gaul and Britain in many variants: Bel, Belenus, Belenos, Belinos, Belinu, and Bellinus. Here in Lancashire I know him as Bel and suspect he gives his name to Belthorn and Belgrave. ‘Belisama’ means ‘Most Bright/Shining/Mighty One’ and also translates as ‘Summer Bright’. She was venerated in Gaul and Ptolemy labels the Ribble estuary in Lancashire ‘Belisama Aest’. Nick Ford suggests the name of the Ribble derives from Riga ‘Queen’ Belisama (Ri…Bel). Within my locality, Bel and Belisama are constant presences as sun god and goddess of the Ribble’s shining waters. However, their presence feels strongest from Calan Mai/Beltane to the Summer Solstice. Etymological and historical links show their associations with Beltane. They also record that ‘Beltains’ or ‘Teanlas’ were lit beside the Ribble on Halloween and ‘cakes as the Jews are said to have made’ are baked ‘in honour of the Queen of Heaven… Belisama.’ It seems possible similar rites took place on Beltane too. The baking of oatcakes on Beltane is certainly recorded in other areas. At a Bel-tein in the Highlands, a large caudle was baked and shared. Nine knobs were broken off as offerings to the preservers of the flocks and herds and to the animals. In Perthshire, the person who received a charred piece of the oat cake was seen as devoted to Baal (Bel) and made to jump through the fire three times. Similar rites are recorded in Caithness and Derbyshire. Anne Ross says this may echo earlier traditions of human sacrifice. This was followed by readings of poems and stories, then feasting, and libations outside the building at the end. I’ve also read my poem ‘Summer Bright’ for Belisama in public. This year, I experienced a magical moment on the hot second week of May without having made any set plans. I went for a bike ride from Penwortham toward Brockholes and stopped beside the Ribble where the sun was dancing from the sparkling water. Downriver I noticed a group of cows had descended into the water to drink. I sat for a while, counting swallows, losing myself in the play of light on ripples, the song of the wind. When looked back, the cows were standing in a semi-circle around me: they seemed to have approached without a sound! On the next sunny day I baked an oatcake and took it to where the cows had descended into the Ribble. As the sun broke through the clouds to shine on the river I offered it to Bel, Belisama, the keepers of cows, the cows, a nearby heron, the swallows and gulls. *According to Harland and Wilkinson ‘the hills dedicated to the worship of the Celtic god Tot, or Teut, or Teutates’. This will be an exploration matching personal revelation with historical research. That is, it sketches part of the process that a polytheist working in a particular tradition must be involved in to match present experience with what can be recovered from a remote time when the tradition was vibrant: finding the old way of saying and making it new. Maponos is being discussed now because we have placed him in the season of Midsummer for his festival and his remembrance. Gods cannot be fixed only to particular seasons but their nature can seem to fit certain times of year when their particular qualities are most apparent. So why now? Maponos is the Brythonic, and Gaulish, form (Maponus in Latin) of the name which became Mabon in the medieval Welsh tales. So Mabon son of Modron in the tale Culhwch and Olwen is Maponos son of Matrona, or ‘Divine Son of Divine Mother’. In that tale he is released from a dungeon by the River Severn at Caerloyw, or the Roman fort of Glevum (Gloucester). He is discovered there when the Salmon – one of the oldest living creatures of the world – leads Arthur’s men there to besiege the fort while Cei and Bedwyr rescue him. So he is brought out of the darkness into the light. Of Mabon, the giant Ysbaddaden says that he “was taken from his mother when three nights old” which links him with Pryderi who was similarly snatched from his mother Rhiannon (from *Rigantona or ‘Divine Queen’) shortly after his birth and brought back from obscurity as a grown boy into the light of his father’s court by Teyrnon (from *Tigernonos, or ‘Divine Lord’). So Mabon or Maponos is the divine youth, like Aengus mac Oc in the Irish tradition, and was linked to Apollo by the Romans. His story in mythological terms is of youth coming of age, of Spring opening to Summer, of the long summer days when the Sun rises early and sets late, bringing vibrant life as everything is at the peak of new growth and the music of the spheres plays through the luxuriant growth of grassy meadows and leafy woods as he comes as a piper or a harpist, as a huntsman or a woodsman, as weaver of the enchantment of long Midsummer days and the twilight of short Midsummer nights. 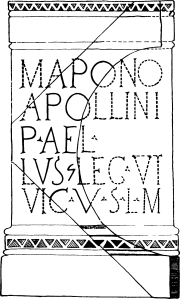 The Ravenna Cosmography refers to a ‘Locus Maponi’ or centre of his worship at Loch Maben in S.W. Scotland and the nearby Clochmaben Stone remembers him. To inspire us who are before thee. Perhaps we could consider the implications of a call to Maponos in this way as, apparently, a guide at the portal to the Underworld/Otherworld,functioning here, as the Romans saw him, in the way Apollo is seen as the patron of the Sybil as prophetess and guardian of the Portal and voice of the spirits. Asking him, then, for aid in calling on the powers of the Otherworld would seem to be an appropriate link with his embodiment as the Muse of prophecy and of inspiration as with the awenyddion of more recent Welsh tradition. So as he is here in the light of Midsummer so he also shows another side of his character facing the shade of the Portal from the nodal opposite of the other Solstice at which his mother, Matrona, brings light from the darkness. What Arthur and his men enacted by violence and attack at Caer Loyw (a name which might also be construed as ‘the shining fortress’) – though with the more subtle help of the most ancient animals of the world – was simply a gesture in their world to a most ancient release of light from darkness that reaches its apogee now with the near perpetual daylight of Midsummer in the Brythonic lands.